Having been awake at the wee hours of the night? and having been asleep at the brightest shine of the sun during the day that made you experience how to live like a vampire?. And with the epistaxis getting from speaking straight English eight hours a day, five days a week? God, good luck to your red blood cells and hemoglobin. Call center, the greatest escape from unemployment for aspiring fresh graduates is not a bad start for building a career. First, it offers just compensation which is equal to or higher than the salary of other professions. Second, if you plan to take International English Language Testing Skills (IELTS) in the future for flying to English-speaking countries, call center is a good training ground. It has Quality Assurance (QA) department which continuously monitors and determines every agent’s room for improvement with regards to communication skills. Third, if you are determined enough to have the brightest future and is more than motivated to go beyond what is expected from you (being above the standard metrics), you can evolve from being a stressed call center agent to being the highest paid employee and a possibility of being the next supervisor of your team, next operations manager of your account or being the next and youngest president of your company. 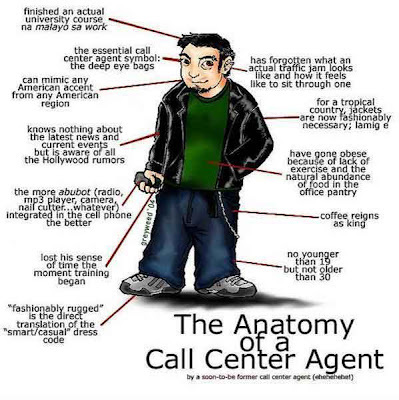 However, as optimistic as it seems, entering and living the call center industry is not that easy. You should have high emotional quotient strong enough to struggle frustrations and stress from not passing the metrics especially if you are still a newbie, and a firm emotion not to be moved when being shout at or cursed by an irate customer on the phone. And, if you are like me who is a racist to Americans, you should be patient to avoid becoming an irate agent who gets rude and condescending when being with a “slow” customer on the phone. And mind you, being patient and kind to difficult customers is a “major major” challenge. Gggggrrrr!!! If you have another choice, do not think of becoming one of those living the night life. If you are able to finish a four to five year course, being a call center agent is being underemployed, which in a way is unfair to you. If you are passionate enough to hold the profession you have been preparing for during your four to five year tertiary education, hold it and do not lose the grip. Do not waste those painstaking years just to let those “imperialists” exploit your cheap labor and more than qualified skills. Don’t wait for the day when doctors, nurses, teachers, engineers and lawyers are gone, when everyone finished with a degree is equipped with no more than a headset and a computer.